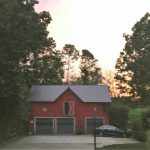 The barn was built in 1903 by the second owner of the home, Dr. George and Mrs. Hattie Starr. Doctor Starr kept his horse and carriage therein order to make house calls! It has been freshly painted, restoring it to the original red color. Please note that the barn does not contain any guest accommodations.